We had a chance to test the 2014 Accord V6 with the six speed manual. We found this $32K vehicle to be as entertaining and maybe even quicker than just about any sports sedan costing less than $50K. Parking at an auto-writers meeting this week at the Monticello Motor Club we found ourselves next to an Accord Coupe with racing stickers pasted all over it. We chuckled, because those make the police reach for the ticket book whenever they can, and also, an Accord with racing stickers? Be serious. As luck would have it we were about to learn a bit about what a fast car the 2014 Accord Coupe actually is. 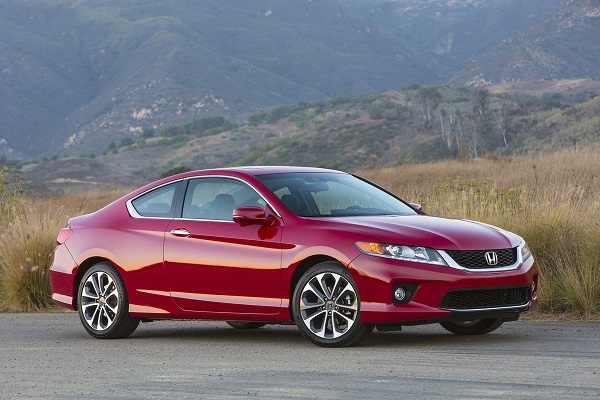 The 2014 Honda Accord coupe has 278 horsepower. It also can be provided with a six speed manual transmission. The combination of these elements makes the Accord almost unique in the US marketplace. It may just be the only front wheel drive coupe with that much V6 power and a six speed stick. We drove the Accord V6 MT (manual transmission) on a racetrack this week and it was a complete shock. First of all the 2014 Accord Coupe is willing to oversteer. Don’t ask us how a front drive car with a big V6 up front can do anything but plow in corners, but this one does not plow (understeer). Instead it is almost neutral in corners and if you play around with the brakes and throttle a bit it is easy to get the car to rotate with the tail a bit as you enter a corner. Somebody at Honda was given the green light to make this car handle. With a curb weight of only 3500 pounds this car has about the same power to weight ratio as a Lexus IS350, Infiniti Q60, Cadillac ATS, or BMW 328i. However, it is front drive, which in any place with snow makes this car a much more useful tool when the snow is falling and one is heading to work. Stoplight to stoplight the Accord V6 MT might just make a few sports sedan owners question why they spent $53K on a car that can’t beat a $32K Accord. Remember, a front drive car has the bulk of its weight over the front tires, so the traction is better compared to rear drive in some cases. All V6 Accords will run to 60 MPH in the mid to low 5 second range. This one has the added benefit of a stick shift to make that run interesting. Exiting turns the Accord V6 MT is amazing. The shifter is slick, as good as any we have driven. Properly timed shifts allow the Accord to be on the power exiting and the car pulls strongly. Approaching the next turn the brakes do not act like sports sedan or sports car brakes, but they feel good. The distances are just a bit longer than in cars costing much more, which is what we found ourselves comparing this one too. The Accord we drove was not an HFP Accord, which has even more go-fast bits. Honda has not yet announced a 2014 version of that car, but for details on what made the 2013 so special please see our prior story. During this event we drove about 12 different cars on track, all of them supposedly more capable than the Accord. What became apparent about the Accord V6 MT is that it would embarrass most sports sedans costing about 30% more money in any form of race, be it a drag race, or as crazy as it sounds, on a road course style race track. This car may just be the best sleeper sports car in the US marketplace. At just $32,400 MSRP with a navigation system and leather it is also by far a better value than almost anything that can keep up with it.